Truck tonnage (Calculated Risk has lots of details here) is a great way to track the real, physical improvement in the economy. It can be volatile from month to month, but there's no denying that this index is reflecting some very impressive growth in the economy in recent years. The December reading was an all-time high, and was up fully 10.5% from Dec. 2010, the strongest year-over-year showing since 1998. This chart compares the truck tonnage index with the S&P 500, and clearly it is suggesting that equity prices have plenty of room to rise just to keep up with the physical expansion of the U.S. economy. It's hard to argue with truck tonnage: there's been a lot of improvement going on out there. Meanwhile, equities are still priced to the expectation that corporate profits are going to collapse in coming years. Good news for contrarians like me. I guess another interesting question is whether the huge increase in stock prices from 1995-2000 and then again from 2003-2007 was ever warranted given the historical averages. Did the value of companies really go up that much or did we have two artificial bubbles driving up stock prices? 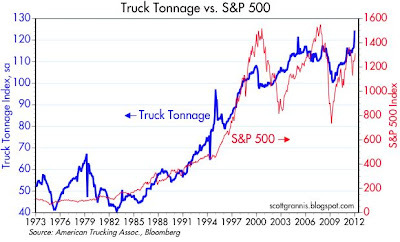 I will celebrate when truck tonnage gets back to historical highs. Until then, the USA is underperforming for no good reason. This matches up to what we're experiencing and hearing at ground level. For example, at a recent trade show a buyer stated that last year, her company had $6million to spend at the show. This year, authorized to spend $16million for retail inventory. This is good news, but it *does* look like one of those blips that will correct itself and return to trend next month. You can see similar 1-month blips on the chart in prior years. Let's hope I'm wrong. Sorry to spoil the party, but alot of the rail and truck tonnage stats are skewed due to the return home of tens of thousands of U.S. troops and equipment from Iraq.